Melbourne Band 380 – If you’re looking for a band that will deliver great, fun entertainment, a dynamic performance and will get any audience involved and partying the night away, then Melbourne Band 380 are your entertainment solution! Melbourne Band 380 have a vast repertoire covering all the classic soul, disco, 80’s, and contemporary hits including a great selection of dinner music. 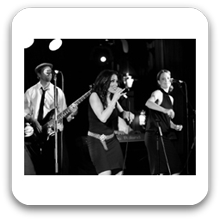 Melbourne Band 380 can offer themed sets with costume changes that can be tailored to suit the style of your event from corporate and private functions to weddings, hotels, clubs and festivals. Melbourne Band 380 offer the flexibility to choose from a 4 piece band to the full 9 piece line up. The nine piece consist of three dynamic vocalists who complement each other in everything they do, a horn section that punches out tight lines and a funky four piece rhythm section of bass, guitar, keyboards and drums. For an even larger band experience Melbourne Band 380 have the option of an extra horn player and percussionist. All the music is played one hundred percent live and we pride ourselves on great musicianship, professionalism and presentation whilst delivering a high energy show. Take a look at our live promo video and see for yourself!. Can perform as a: 4 to 9 Piece Band and are available to perform in Melbourne and Surrounding Areas.